Masala Stuffed Bhindi's - Do u think that it is a tough and long job.. No, its so easy and you can make it in less than 10 minutes, if you have scrapped coconut on hand. I got the recipe from Tarla Dalal's Microwave Cooking Book. Cooking this in Microwave is so easy, and it just takes less oil into it. You can also prepare this in your Pan or Iron Skillet, by just placing the stuffed Bhindi's on the Skillet and leaving 2 tbsp of oil, to the sides of the okra, and letting to get fried for about 3 minutes in slow flame. again flip the bhindi's to the other side and fry them again for 2 minute's. Wash the Okra's /Bhindi and Dry them on Clean Towel. Make sure Okra's are not wet, before you proceed. In a Cup, add the finely chopped Corriander Leaves, Grated Coconut, chilli powder, corriander powder, cumin powder, turmeric powder, asafoetida, little bit of salt and mix well. add 1 tsp of oil to the Masala and Mix well. 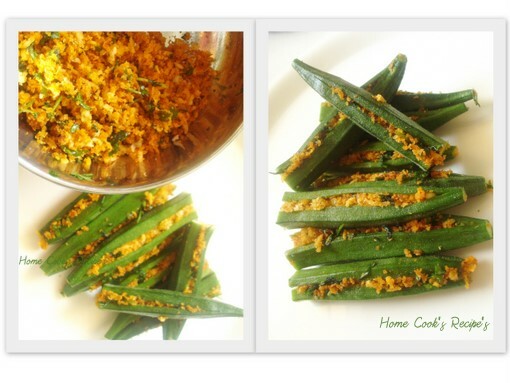 Now Slit the Bhindi's Vertically little deep, so that you have enough space to put in the masala inside the Bhindi's. 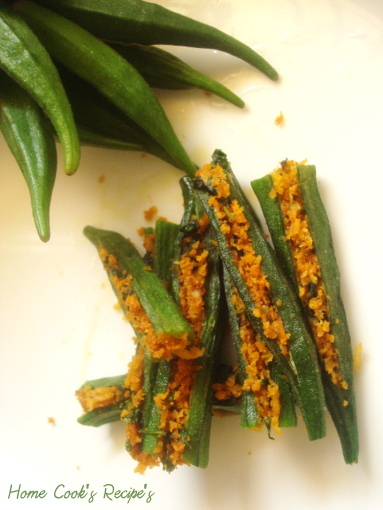 After Slitting the Bhindi's, Take a Big Pinch of the Masala and stuff it inside the Bhindi, all along the vertical slit. Neatly stuff all the Bhindi's. If you are using a Microwave, Place the stuffed Bhindi's in a Microwave Safe Plate, Do not place Bhindi's one over the other. sprinkle few drops of oil over the Bhindi and Microwave it on High for about 4 minutes 30 seconds. Preparing in your Pan or Iron Skillet: Just place the stuffed Bhindi's on the Wide- Skillet and add 2 tbsp of oil, to the sides of the okra, and let it to get fried for about 3 minutes in slow flame. 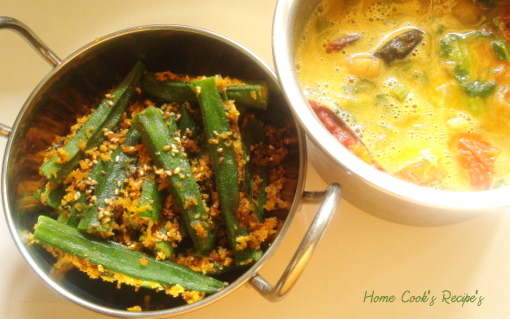 again flip the bhindi's to the other side and fry them again for 2 minute's. In a small Tadka Skillet, heat a tsp of oil and add sesame seeds and let it pop and add to the stuffed Bhindi's. Okra's turn so tender on cooking. 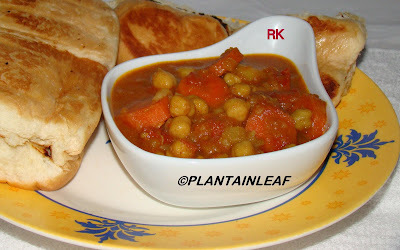 Iam sure Okra lovers will love this. 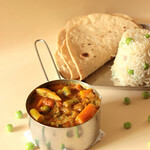 and this was best with Sambhar Rice. Elephant Foot Yam is said to be a Blood Purifier, I use this in cooking once a month. This Puli Kuzhambhu is the one, i was planning to try, and i used Karunai Kizhangu / Suran in it, it came out so well. 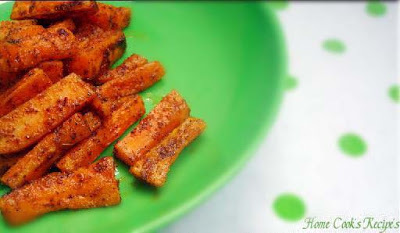 When we eat this Kizhangu / Suran, we will get a pricking sort of feeling on our tongues. to avoid it, this Suran should be washed in Tamarind water. also it can be cooked in tamarind water. Remove the Outer Brown skin of the Karunai / Suran / Yam. Wash and Cut them into small cubes. 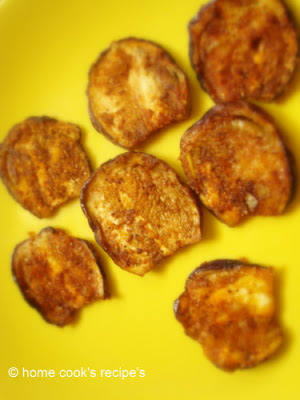 add a pinch of salt, 1/4 cup of water, a pinch of turmeric powder and boil it for 4 minutes till they are half-cooked. Soak the Tamarind in a cup of warm water for about 5 minutes and squeeze the tamarind out. 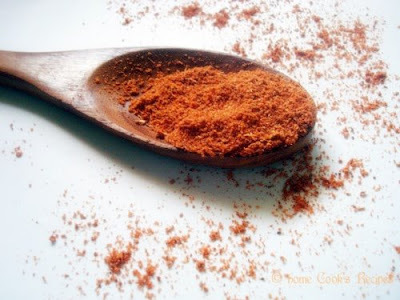 Add a pinch of turmeric powder, 2 tbsp of chilli powder, 2 tbsp of corriander powder to the tamarind water and mix well. Heat Oil in a Wok or Pan, add mustard and let it pop, add asafoetida powder and curry leaves. Now add the Shallots / Small onions and Garlic and saute them for about three minutes, till they are semi-cooked. 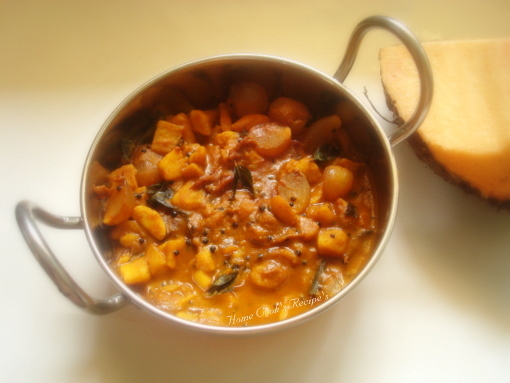 Add the Boiled Suran / Karunai Kizhangu / Yam to the Pan and mix well with Onions. Now add the Tamarind water to the pan and mix well. Add salt to taste and add 1/4 of water and let it boil. after it starts bubbling, slow the flame and close the pan with a lid, and let it rest for 5 minutes. 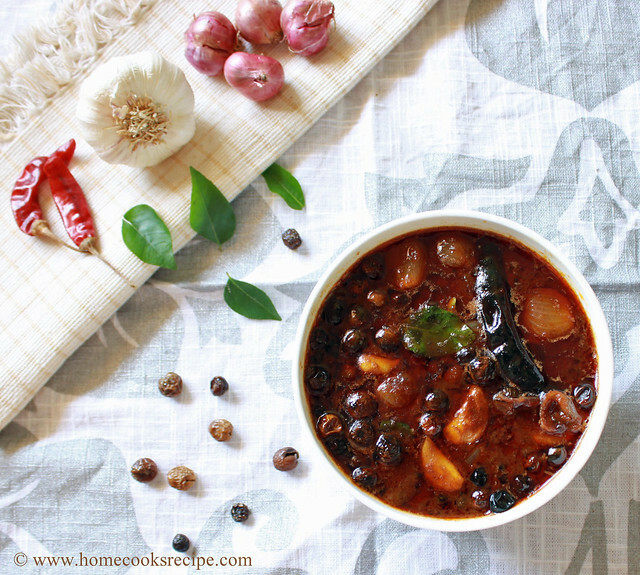 Serve it Hot with Rice and Pappad. Cabbage Thoran makes a great side-dish for this. My Lunch Platter Today, Cabagge-Peas Thoran, Karunai Puli Kuzhambhu and Buttermilk. 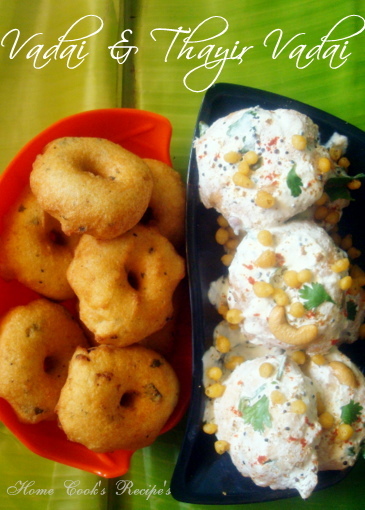 Check my Perfect Vadai and Thayir/Dahi Vadai's, which i prepared last week end. Check the Event Announcement Here. Thank You All for making the event happen..It was really a great event, which helped me to know more about Moraccan Cuisine. Thanks Vaishali!!! If I had missed any of your entry or the links are dead links please mail me to glassofhoney@gmail.com or leave a message below in the comment form. i will do the correction as soon as possible. 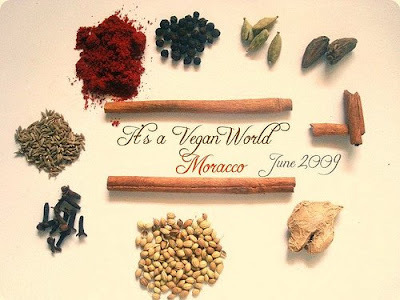 Dont Miss the next It's A Vegan World edition IAVW-British. If you want to have a glimpse of Previous IAVW - Thai edition, check here. 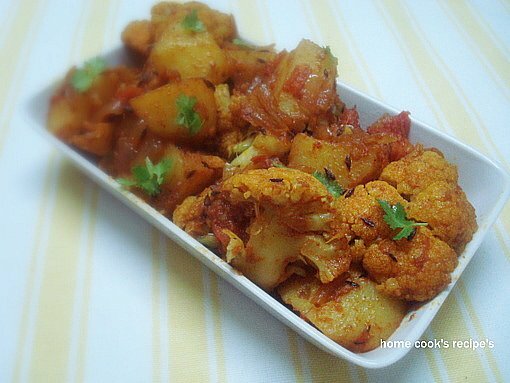 Aloo Gobi Masala is my favourite, when i go to restaurant's, But never intended to try it at home till i saw Meeta's Punjabi Aloo Gobi. 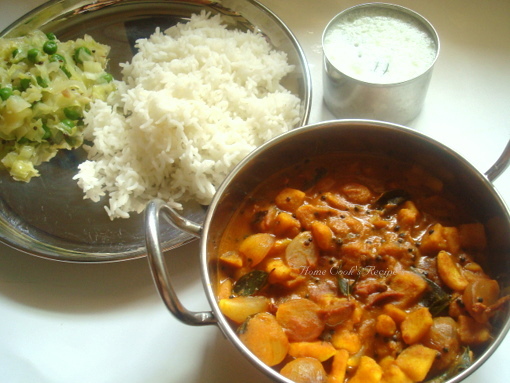 i took the key ingredients from her recipe and went ahead with my own way of making curry. it came out So Good. we liked it a lot. Thou its a dry one, you can make it in gravy form by adding Fresh Cream in the last. 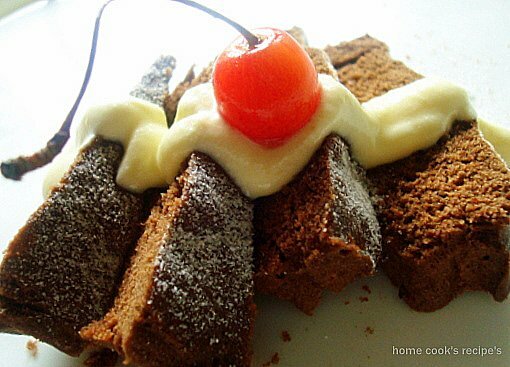 Iam sure this recipe will amaze you all, as it amazed us. 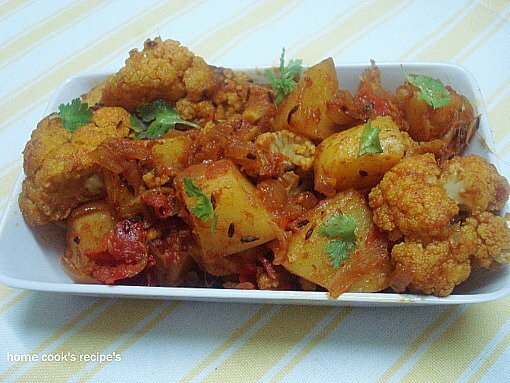 Cut the Potatoes (aloo) into cubes. take care to cut them into equal sizes. also cut the Cauliflower(Gobi) into equal size floret's. Put the floret's in Boiling water with a pinch of turmeric powder for about 2 minute's and drain them and keep it aside. 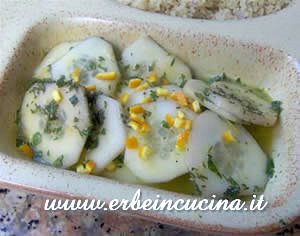 Put the Cauliflower's and Potatoes in your microwe for about 5 minute's, or steam them for about 7 minute's, till they are atleast half-way cooked. Heat a Pan, add Desi Ghee to it, let the ghee get hot, and add cumin seed's to it. roast the cumin seed's. Now add the Crushes Ginger-Garlic-Green Chilli mix to the pan and saute them for half a minute. Add the Finely chopped onion and saute it till they turn translucent. then add the finely chopped tomato. fry them all for a minute. Now add Turmeric powder, chilli powder, Corriander powder, cumin powder and Garam masala to the onion tomato mix. 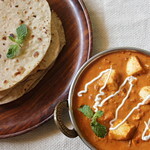 let the masala's mix up well with the onion-tomato. Then add the half-cooked Potatoes and cauliflower to the pan and mix well. cover the pan with its lid and let the potatoes and cauliflower sit in the low flame for about 5 minute's till they get fully cooked. Add Corriander Leaves to Garnish and add a tsp of desi ghee as a finishing serving touch. 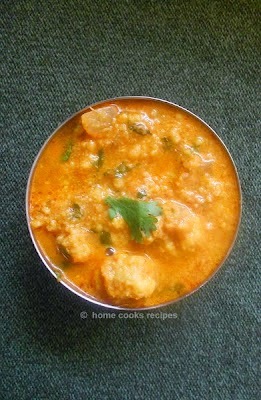 If you want the aloo gobi in gravy form, add 4 tbsp's of fresh cream before a minute to switch of the flame. Serve it with soft chapathi's or Pulkha's. Hope you all Like it. Iam getting ready with IAVW-Moracco Roundup, my next post will be the roundup. see you all there, till then Have a Happy Weekend! 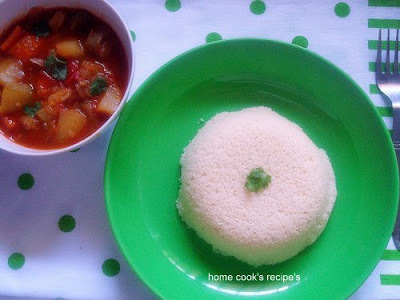 This Recipe works best in microwave oven. Chocolate Cake with a hint of Coffee really tasted Good. My apartment kid's tasted and certified it as a Good Cake. Surprisingly my hubby also liked it. 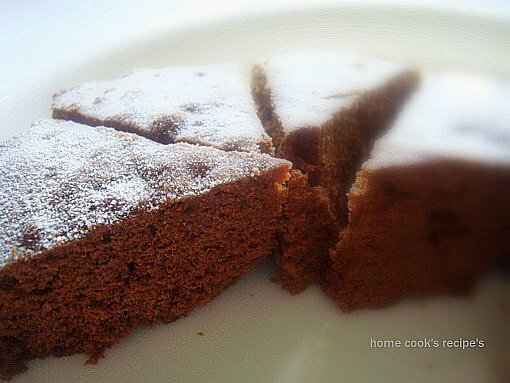 so this recipe is yet another Microwave Chocolate Cake Recipe from the blog world. I have taken care on measuring the exact ingredients and produced here. so just follow the recipe. it yields about 8 slice's. Now keep adding the Flour Mix little my little to the Egg mix, Mix them well with a Spatula. If the Mix is so thick, add few drop's of warm milk to make the flour egg mix little thin. Grease a 3 inch Microwave safe bowl with Butter and Line it with a Baking Sheet. Pour the Flour Egg Mix to the Bowl and level the top by the spatula. Microwave the cake on High [900 W] for about 3 minute's. To check whether the cake is cooked or not, insert a knife and ensure it comes out clean without any sticky, when pulled out. for about 5 - 7 minute's. Dust some Powdered Sugar upon the Cake if desired. 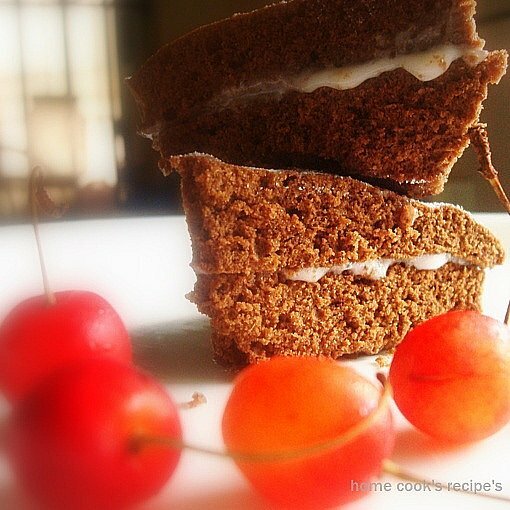 If you wish to decorate and fill the cake with whipped cream, slice the cake and fill the cream, only after the cake is cooled completely. I used Blue Bird Instant Whipped Cream. I just followed the packet instructions and it worked well for me. Thou the cake looks stiff and not moist in the Pictures. it was little moist and tasted pacca chocolaty but with a hint of coffee. Its my Milestone Cake. I used Little Butter, and less oil, inspite, it tasted Great. For this recipe, you got to use 4 tbsp's of butter and 1/4 cup/ 4 oz of oil. Give your verdicts to this beginner. Iam very late in posting my final entry to IAVW-Moracco. As I was busy(after a long time, iam mentioning the word busy.) taking my kid to playschool. Also i had guest's and isnt this enough to explain my busy schedule's. 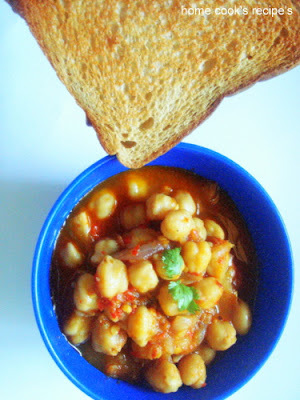 This Moraccan ChickPea Stew is another recipe that i got hooked, from Vaishali's blog. I loved these stew with Whole Wheat Bread. 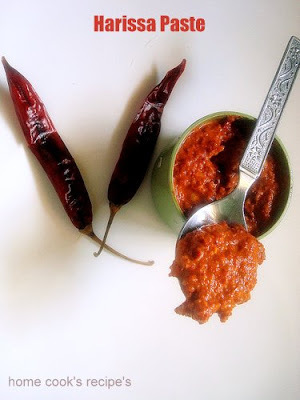 To prepare this delicious Moraccan stew, you got to have Harissa paste, which you can make it in a jiffy, with just a pre-planning of soaking the Red Chilli's for Two Hour's. 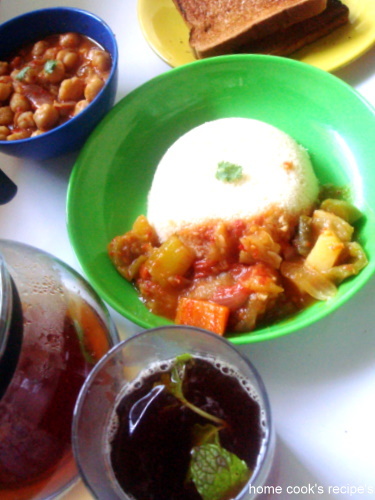 How to make the Moraccan Chickpea Stew? Dice a Onion, a Tomato, and mince 5 garlic pod's.Heat a tbsp of oil in your Pressure Cooker, add the diced Onion and minced garlic, saute it till the onions turn translucent. add chopped tomato and saute them. add little salt to it and mix well. add 1/2 tsp of cumin powder, 1/2 tsp of corriander powder and mix well. add the Chickpea(soaked for 12 hours) and mix well. Now add 2 tsp's of Harissa Paste and mix well with the veggie's. add a cup of water and pressure cook them upto 5 whistle's. Add Corriander Leave's to Garnish. 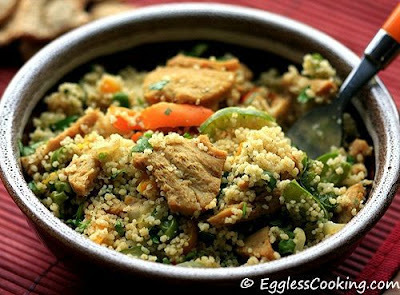 This is Best, served with Couscous and Bread's. 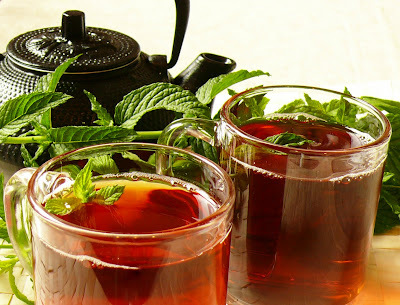 How to Make Moraccan Mint Tea? Tea is served during meal times in moracco. This is the drink, that is served, when the Moraccan's have guest's. Serving Mint Tea is considered as Hospitality. This is the Sweater Tea, with the flavour of Mint. Tea is cleaned with boiling water before being dried. This removes dust from shipping and supposedly makes the tea less bitter. Tea and boiling water are combined, and may be boiled further for several minutes. After that, sugar and mint are added and mixed into a teapot with a long, curved spout. 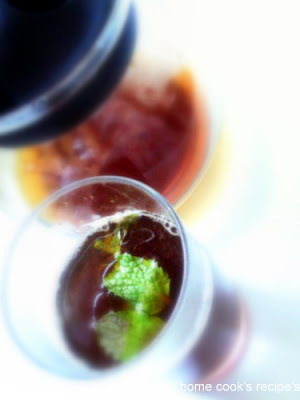 The sugar may also be combined with the tea and water in the first infusion, rather than with the mint after brewing. Using a traditional curved spout allows the tea to be poured into tiny glasses from a height of approximately half a meter to form a foamy head. It is then returned once or twice to the teapot for a good mix. I loved the Tea with Ice-Cube's. Don't miss to try this Absolute Refreshing Tea. Here is the Moraccan Feast, that goes on my part to IAVW-Moracco, event designed by Vaishali. 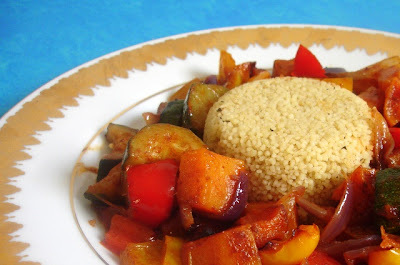 Couscous with Seven Vegetable Stew, Mint Tea, Chickpea Stew and Bread. Thank You all, for sending in your entries, i will do the rounup as soon as possible. You can even send me your entries till 6th July. as i will be getting ready with the roundup by the weekend.